Fragrant red flowers Leaves change color throughout the year Hardy Zones 4-9, Sun to part shade Height: 9" Spread: 16" The plant you will receive is growing in a four inch pot. HEUCHERA: Vigorous and large flowered, these varieties make excellent border plants with their nearly evergreen foliage in neat clumps. Bright flowers are held aloft on airy stems in May through July. Can be used in a shady courtyard, pot or as a groundcover under deciduous trees. Benefits from deheading. 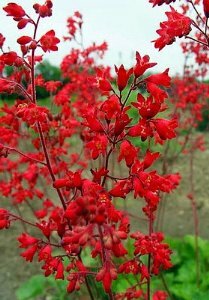 A fragrant coral bell with vibrant shades of red on wispy, vertical stems. Vigorous and many flowered, Heucheras attractive foliage and airy flower panicles provide color and contrast.